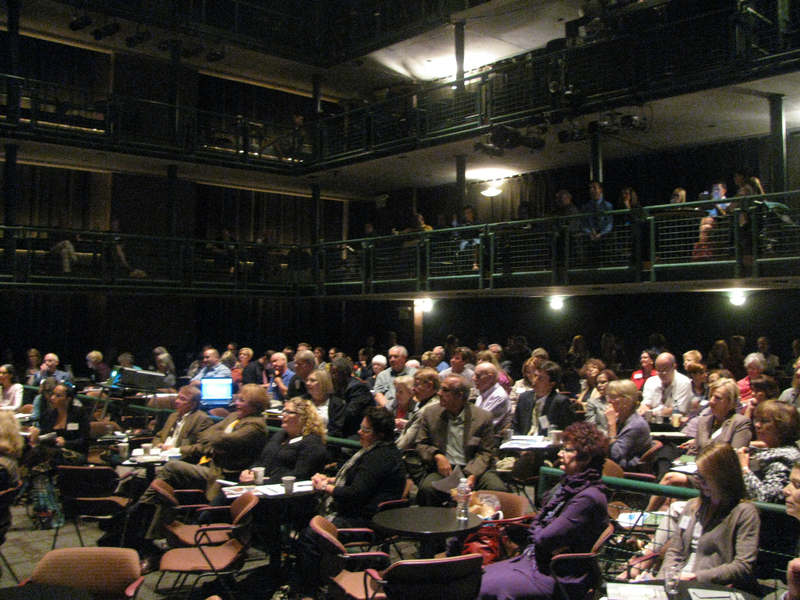 The Culture Builds Florida Conference participants in the Jaeb Theatre at the David A. Straz, Jr. Center for the Performing Arts. Photo by Sandy Shaughnessy. The David A. Straz, Jr. Center for the Performing Arts was the setting for Tuesday’s official launch of the Culture Builds Florida campaign. Our agency, the Florida Division of Cultural Affairs, planned a day-long conference to celebrate the successes of arts and culture, and to introduce the new Culture Builds Florida initiative. More than 200 arts and cultural administrators, artists, business representatives and cultural patrons joined us for the day’s events. The day began with remarks from Florida’s Secretary of State and Chief Cultural Officer, Kurt S. Browning. Secretary Browning mentioned some of the tangible benefits arts and culture bring to Florida, like the 88,000 full time equivalent jobs non-profit arts and culture generated annually, the $3 billion of direct economic activity spurred by the same organizations and impressive statistics about out-of-state cultural tourists, who stay longer and spend more than other travelers. We heard from three individuals who are making contributions to Florida’s arts and cultural community. The first was Fran Powers, executive director of Powerstories Theatre, whose organizations has served over 10,000 people in the past 12 years. Gus Nick Paras, AIA architect, spoke about the ways architecture contributes to Florida’s cultural landscape. Carol Mickett and Robert Stackhouse called on the audience to think of artists as small businesses, contributing to the economy and leading business innovation. After a short break, Senator Nancy Detert, Representative Rich Glorioso and Representative Seth McKeel presented the group with tips for increasing advocacy success. The elected officials urged those present to educate their elected officials about arts and culture, and to shout from the mountain tops the value of arts and culture. The seventy-five minute session, which included time for questions and answers, was moderated by Malinda Horton, executive director of the Florida Association of Museums. After a lunch break, the learning sessions resumed with sessions on social media and partnerships. The afternoon concluded with keynote remarks from Randy Cohen, Vice President for Research and Policy at Americans for the Arts. Mr. Cohen spoke about the economic impact of arts, culture and creative industries. There has never been a more important time for our industry to speak about the benefits of arts and culture. Arts and culture can lead us to prosperity. They can and will make a difference. As our campaign moves ahead, we aim to show the ways arts and culture bring out the best in each of Florida’s 67 counties. We will tell the story loudly and proudly: Culture Builds Florida. Tuesday’s conference was just the start. This entry was posted in Postcards and tagged Arts Advocacy, Creative Industries, culture builds florida, David A. Straz, florida division of cultural affairs, Jr. Center for the Performing Arts, Secretary of State Kurt S. Browning by culturebuildsflorida. Bookmark the permalink.